We strive to post BYGL Alerts based on timely, current observations. However, sometimes our discoveries are made much later as we try to identify what we photographed during the growing season. Such is the case with this report. This past June, I came across some odd, wart-like symptoms on the upper leaf surfaces of plants I could only identify as some type of morning glory (family Convolvulaceae). I was certain at the time that the symptoms were caused by an eriophyid mite (family Eriophyidae). The "warts" looked like symptoms produced by oak leaf blister mites, Aceria triplacis, on its namesake host. Or, walnut pouch galls produced by the eriophyid, Eriophyes brachytarsus. Of course, the first question you should ask in plant problem diagnostics is "what is the plant?" I was confident at the time that the plant was some type of morning glory, but I couldn't find a diagnostic "fit" by searching the web using "eriophyid mites" and "morning glory" or variations on this theme. So, I abandoned the search for another day; it was June and there were plenty of other diagnostic shiny things to pursue. My lack of persistence came home to roost today as I was trying to label the images taken at the time so I could use them for teaching. I had no diagnosis, or even a correct plant ID, to guide me on where to place the pictures in my image library and I hate adding more images to my ever-expanding "Unknowns" image folder. I started all over again and finally identified the plants in my pictures: wild sweet potato (Ipomoea pandurata, family Convolvulaceae). This plant was new to me although I have probably walked past it many times. Armed with a plant name, I began searching the web for information on eriophyid mites on wild sweet potato … and barreled down a diagnostic blind alley by ignoring another question you should ask in plant problem diagnostics: "what exactly do you see?" I consider this one of the most important questions to avoid getting lost in the diagnostic wilderness. Looking closely at one of my images, I saw tiny, white, puffball-like structures in the indentations on the underside of the leaves rather than the expected felt-like material produced by an eriophyid mite. It wasn't an eriophyid mite after all; it was possibly a plant disease! I was emerging from the diagnostic wilderness! 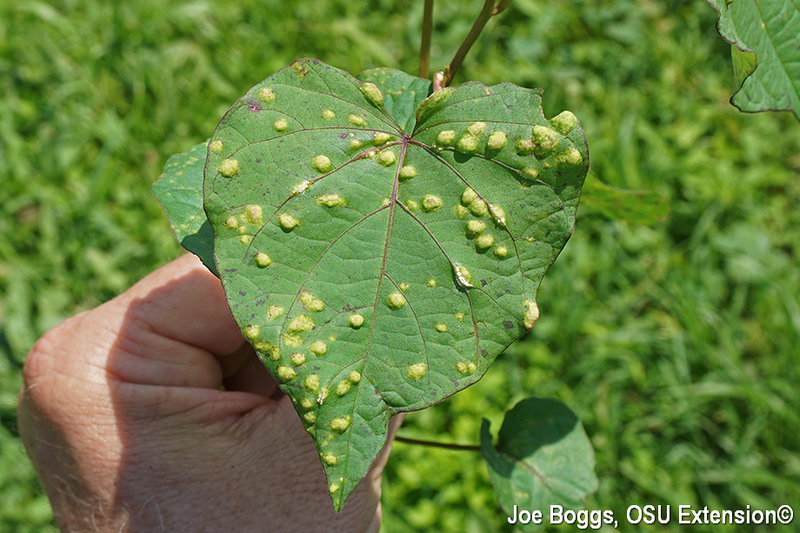 A quick search for diseases of wild sweet potato revealed a disease and plant pathogen that were new to me. The disease is called white rust which may indicate a fungal infection is involved; however, the pathogen is Albugo ipomoea-panduratae. This is not a fungus; it's an oomycete. These fascinating organisms were once lumped in with fungi. However, oomycetes are now grouped in completely different taxonomic categories; some even say a different kingdom. Unfortunately, many types are still given names that make them sound like fungi such as water molds or downy mildews. Knowing that oomycetes are not fungi is more than a taxonomic exercise. For one, oomycetes go through a mobile stage with whip-like flagella that allows them to swim in water. This explains why irrigation ponds and streams can play an important role in spreading these organisms and their resulting plant diseases. In fact, some water molds produce very significant plant diseases such as downy mildew of impatiens produced by Plasmopara obducens and downy mildew of cucurbits produced by Pseudoperonospora cubensis. Of course, the most notorious of all is late blight of potato produced by Phytophthora infestans which was responsible for the Irish potato famine and resulting diaspora of the Irish people. White rust can occur on both cultivated and wild sweet potatoes as well as many other morning glory family members. However, various web resources indicate the disease rarely causes damage severe enough to warrant control measures. Still, the location where I found the infected wild sweet potato plants may speak to the connection between water and pathogen spread. The plants are in a park frequently inundated by flood waters from the Little Miami River. I've learned from experience that a successful plant problem diagnosis is often the result of perseverance; even dogged persistence. Sometimes it happens quickly, sometimes it takes months or even years. I also keep re-learning that ignoring important plant problem diagnostic questions can add to that time; even contribute to my "unknowns" folder. We're updating our "20 Questions on Plant Diagnosis" OSU Fact Sheet. In the meantime, you can review the current version under "More Information" below. Obviously, I need to take my own advice.